Today’s tutorial is from the Legends collection from Bead Landing I received from Michaels.com. I was inspired by the edgy feel of the accessories. I’ve been in love with spikes lately and its everywhere in fashion from jewelry, shoes, and apparel. The look is edgy and sophisticated. 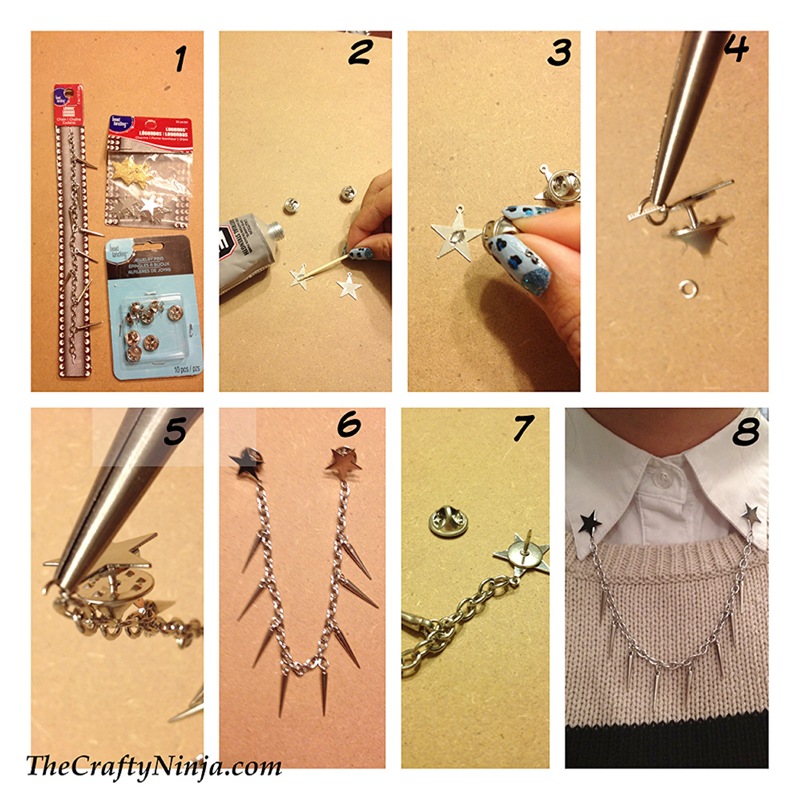 I had so much fun creating this DIY Spike Collar Chain Tips for Michaels, check it out on their website here. 1. All the supplies can be purchased at Michaels: Beads Landing Legends Spike Chain, Beads Landing Legends Star Charms, Beads Landing Jewelry Pins, Beads Landing 2 MM Jumprings, E6000 Adhesive, Toothpick, and Jewelry Pliers. 2. Using the toothpick apply the E6000 to the back of the Beads Landing Legends Star Charms. 3. Attach the Beads Landing Legends Star Charms to Beads Landing Jewelry Pins and let dry for about 30 minutes. 4. Using the Jewelry Pliers attached the Beads Landing 2 MM Jumprings to the Star charms. 5. Also attach the Beads Landing Legends Spike Chain to the Jumpring and close. Repeat the other side. 6. 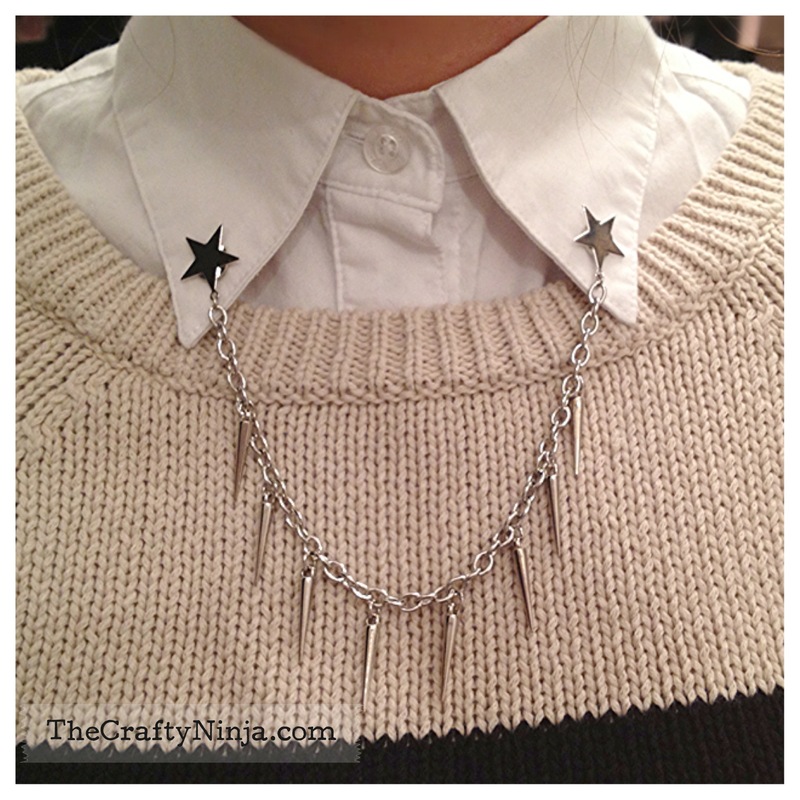 Front view of the Spike Collar Chain. 7. Back view of the Spike Collar Chain. 8. Accessorized with a shirt collar for an edgy and sophisticated fashion statement.